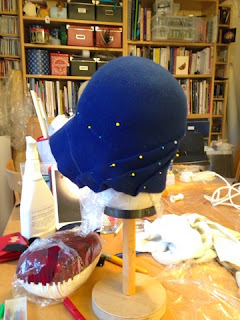 So last year I totally failed to take part in the Historical Sew Fortnightly which is organised by the marvelous Dreamstress. 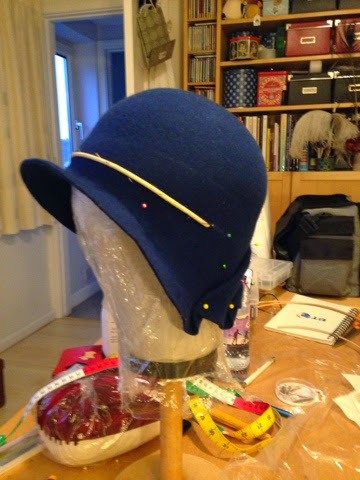 This is a great idea, whereby sewing challenges are set fortnightly, and participants complete them by recreating historical garments, in 2015 the challenges will be monthly. 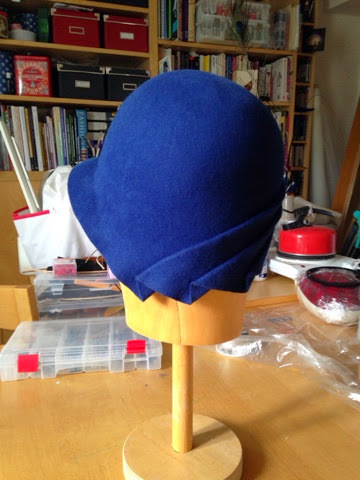 I really wanted to take part last year but things like getting married, or being ill, or making other peoples wedding dresses took up all my time and all my good intentions went phut. However, this year things are going to be different. As mentioned in a previous post, I have decided that dead lines are no longer my friend so I'm changing my work patterns to suit my crappy health. This does leave me some more time to do some me sewing, and so here is my first effort for the Historical Sew Monthly. 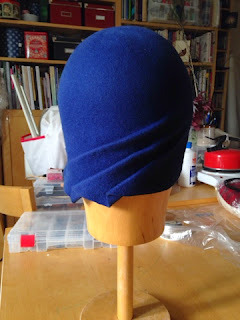 The February challenge is Blue, to make an item that features blue, in any shade from azure to zaffre. 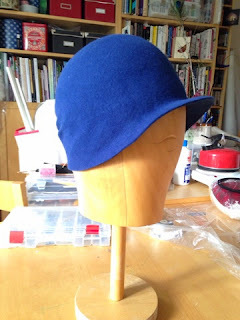 I've been wanting to do some more free form blocking so a 1920's pleated cloche is my first challenge. I began by blocking the hood over my domed hatblock as I wanted the top of the hat to have a classic, rounded bell shape. 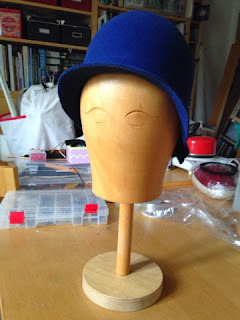 When it was dry I marked the head fitting line (where the hat will sit on the head) using my hem marker. I'm quite pleased with this way of marking the headline as it lets you decide the depth of crown you want really easily and you don't have to take it off the block first. 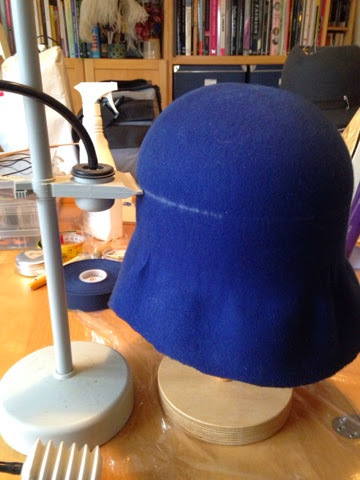 Once the hood had dried I removed it from the dome block and started to shape it on my malleable wig head which I covered in cling film to protect it from any dye leaching from the hood when I steamed it. I took inspiration from some extant examples of felt cloches that I found online. 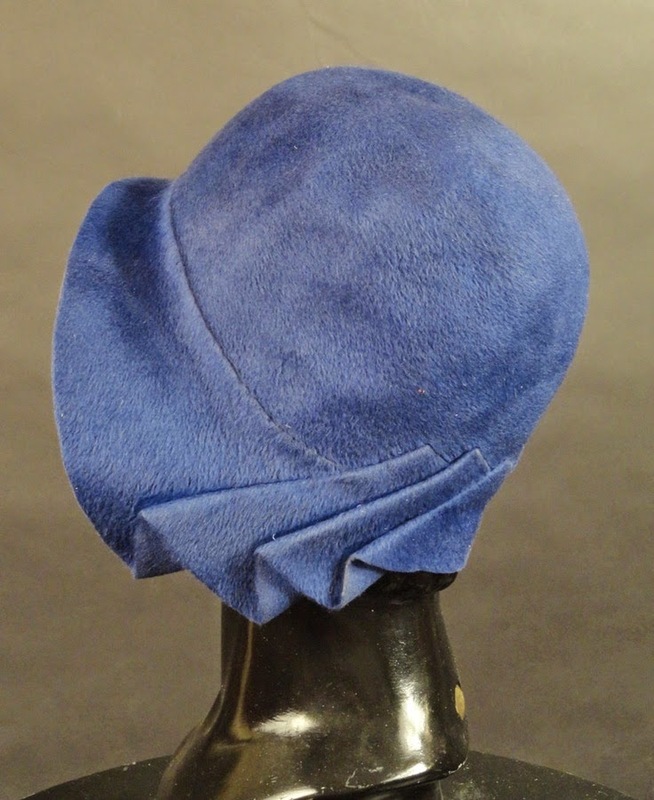 The first is a blue fur felt cloche with lovely pleats at the back, it was for sale a while ago on Vintage Martini. 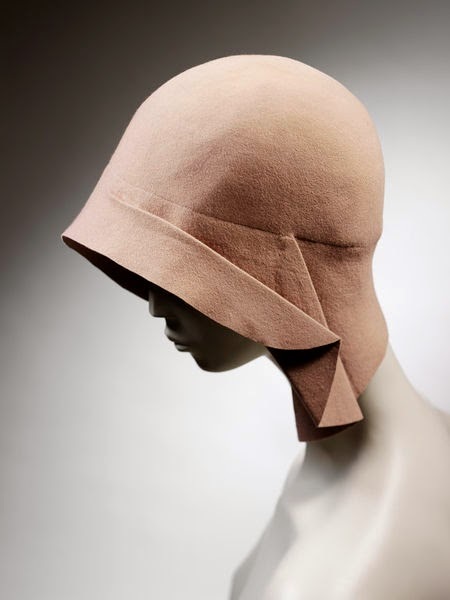 The second is a 1928 hat by Miss Fox that is in the V and A Museum, this time the pleats form part of the brim at the front. I decided to focus my pleats at the back to create an asymmetric sweep around the base of the head and then hand form a turned up brim at the front. I used blocking reed to secure the front head fitting so it would not stretch it out of shape whilst forming the brim. Pattern: No pattern, based on extant examples. How historically accurate is it? 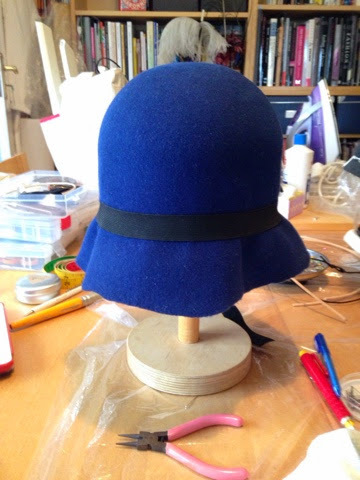 The wool felt hood is period accurate and the cloche is entirely hand sewn. I used modern water based hat sizing, as the chemical version that is technically accurate is seriously toxic! So 95% accurate. Hours to complete: about 10 hours, not including drying time. Total cost: I have had the felt hood for ages so not exactly sure! They cost about £5 and maybe £2 for the petersham and thread. So approx £7.